Forget the stars, hire Transformers and don't forget the women  here are the 10 things every movie mogul should keep in mind when it comes to the summer of 2010. The 2009 summer-movie season began the first weekend of May with the prequel X-Men Origins: Wolverine, and is ending before Labor Day with Halloween 2, a sequel to a remake. That pretty much sums up the artistic ambitions of summer movies. Familiarity breeds contempt only among critics; the mass audience keeps paying for more of the same. They may see the "new" movies while wearing 3-D goggles, but the product is the same: cinematic Pringles. At the end of a busy season we present the 10 lessons these movies teach  the dictates Hollywood lives by and the reasons movies are so ... similar to other movies. But don't blame Hollywood bosses; blame the audiences. So conservative are moviegoers, they punish stars who try something different. In Funny People, Adam Sandler went deadly serious  and into the box-office commode. Sacha Baron Cohen was nearly lynched for putting an oily edge on his Brüno character. (Baron Cohen is not a star; Borat is.) For once, comedy actresses, Sandra Bullock and Katherine Heigl, sold more tickets than the big comedy actors  by sticking to the basics of funny romance. Ticket sales have been up this year, and so were some of the films: Up, for instance. Others showed the only kind of ingenuity that pays off: twisting genre conventions into new forms. 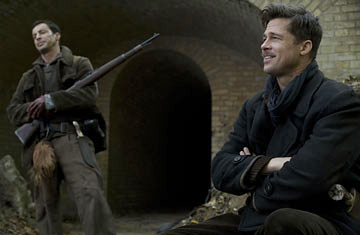 That what Neill Blomkamp, the season's big discovery, did with the sci-fi District 9, and what Quentin Tarantino did to the let's-kill-Hitler war-movie plot in Inglourious Basterds. Both films found large audiences, which is nice. But a flat-out original idea, brilliantly imagined? Save that dream for Oscar season. Just kidding!